Diageo is the world′s leading premium drinks business with an outstanding collection of international brands across spirits, wine and beer including Smirnoff, Johnnie Walker, Guinness, Baileys, J&B, Captain Morgan, Tanqueray and many more. Our iconic companies across Africa; Guinness Nigeria Plc, Guinness Ghana Breweries Ltd, Guinness Cameroon SA, East African Breweries Ltd, Meta Abo Brewery SC and Brandhouse Pty Ltd (Diageo’s joint venture with Heineken and Namibia Breweries in South Africa) are all part of Diageo, which delights consumers with its outstanding brands in 180 markets around the world. 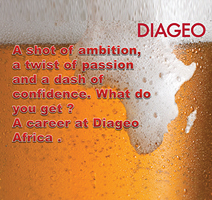 Diageo employs over 6,500 people in Africa and benefits many more indirectly through the production, distribution and promotion of our brands. 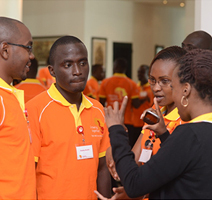 Our people are critical to our success; we foster an inclusive and enabling environment where all employees are valued and supported in reaching their full potential. 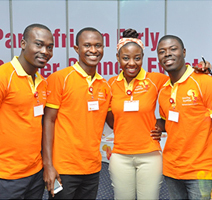 We know the growth of our business is fuelled by attracting and growing amazing people and we are passionate about developing great African leaders to grow our businesses today and tomorrow. Our great range of brands and geographic spread means that people can celebrate with our products at every occasion no matter where they are in the world. This is why ′celebrating life every day, everywhere′ is at the core of what we do. "Having real roles & responsibilities might seem challenging at first but the best part of it all is that everyone around you will show so much trust in you to deliver that you are just overwhelmed by it." "With my background and passion for community investment, it was an easy choice. 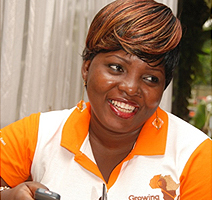 I knew at Diageo Africa I’d be able to add real value." Diageo Enterprise Operations is part of the Diageo Business Service Organization that is a global multi-functional business that provides shared service offering across DIAGEO globally. It provides services in the scope of Order to Cash, Source to Pay, Record to Report, Financial Controllership and Data Management. The Credit Risk Analysis Stream is part of the End to End Commercial process that entails all credit risk related controls for DBS served markets. Significant cross-market functional responsibilities with the aim to deliver a seamless end-to-end commercial service. It ensures proper operation of processes from incoming fund allocation to customer ledger maintenance, order release, outstanding follow-up and overdue management, including credit limit control and reporting. Service Delivery entails issue resolution and close business partnering with the credit risk, customer service and commercial market teams. Guinness Nigeria is listed on the Nigerian Stock Exchange and with an on-trade dominance market and a fast growing off-trade channel. Nigeria has specific nuances including: Market-specific Ways of Working, government regulations, different currencies and infrastructure challenges requirements. Responds positively to direction and shows energy in delivering what is expected within own area of work. Understands the need to be part of a high performing team and supports the actions of others to deliver this. Performance commentary of daily cash collection report and timely circulation to HODs in market. Calculation of interest on unhealthy customers with overdue and managing the conversation with the customer on how to turn around the status of their account. Attending to issues/complaints from customers and following up on claims made and resolve any balance confirmation and reconciliation issues. Continuously look for process improvements to drive customer satisfaction and raise service efficiency. Health check analysis and waiver request management through monitoring of stock levels held by Trade Customers (Distributors) are in line with outstanding debt. Assessing the customer risk and propose to the Credit committee for changes on the credit risk category for all customers. RRS management through timely collection of monthly loan repayments, creation of codes for new DBs and resolution of reconciliation issues. The purpose of the role is to grow Diageo share of market in the On Trade by increasing spirits penetration, driving recruitment of consumers into Diageo’s spirits portfolio and building superior customer relationships to ultimately outperform the competition. Territory analysis, planning and execution to drive volume/value growth and achievement of KPIs. Execute formal on trade strategy as per defined standards of excellence in Business Plans and Cycle activity. Collaborate and build superior relationships with the On Trade and Redistributor customers servicing relevant territory. Educate and empower outlet staff to become advocates of Diageo brands through educational marketing platforms and other in-store staff incentive programs. Plan and collaborate with Reserve Ambassadors to win with the Reserve Portfolio in the right outlets and with the right consumers. Execute out of channel opportunities and occasions in line with brand/customer marketing guidelines. 100% adherence to customer calls as per guidelines per outlet, assigned route and frequency. Manage territory budget and adhere to Measurement and Evaluation business principles. Live and adhere to the Diageo compliance agenda and code of business conduct. Challenger mind-set; problem solver; relationship builder; hard worker; team player; innovative; resourceful. S/H management; networking and influencing; communication; selling skills; planning; negotiating; training and development; performance management; systems; commercial acumen, collaboration, etc. As a global leader in beverage alcohol, our 200+ brands are part of everyday celebrations in over 180 countries. Our ambition? We want to be one of the best performing, most trusted and respected consumer products companies in the world. Ever since Arthur Guinness took out a 9,000 year lease on a Dublin brewery, some 250 years ago, we became a business that is defined by the character of the people who work here. It took immense character from Alexander Walker to convince the captains of every ship in the port of Glasgow to take crates of Johnnie Walker to the four corners of the world. Today, nothing’s changed. We’re proud to be more than 30,000 talented people. While they make our iconic brands ever stronger around the world, we help them go further than they thought possible. In fact, we’re helping to define their career growth through stretching roles and exciting development opportunities. Diageo is where you’ll find a wide variety of personalities, experiences and perspectives, wherever you’re based in the world. It makes for a stimulating and rewarding working environment, where everyone can flourish.